Supporters of a recall election to boot La Plata County Commissioner Gwen Lachelt from office have less than two weeks to collect about 1,100 signatures to put that question to the voters. The deadline was Friday to turn in about 7,500 signatures, but the effort fell short. Turns out, they get additional time to make it happen, the Durango Herald reports. An unusual provision in Colorado law allows recall supporters another 15-day period to collect more signatures and to try to correct any deficiencies in signatures rejected by La Plata County Clerk and Recorder Tiffany Parker. However, Lachelt was counting her chickens before they hatched. They needed 7,505 signatures to trigger a recall election. They brought in 6,400 unverified signatures. Thanks to all my many supporters who Declined to Sign. I look forward to continuing to serve La Plata County. Lachelt has two options once the signatures are gathered and verified: She can either resign or fight it. Word is she plans to fight it, and is raising a bunch of cash from environmentalists who got her into this mess in the first place. Conservation Colorado is the major donor, contributing more than $30,100 to United Against the Recall, which only had $3,200 cash on hand by March 23, the Durango Herald reports. Tom Steyer is a huge contributor to Conservation Colorado’s victory fund — $280,000 in 2016. A huge chunk of Lachelt’s fund was spent on consulting, $10,725 to Grassroots Campaign of Boston, and $2,000 to Progress Now Denver. 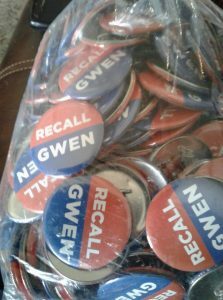 In addition, La Plata County for Gwen Lachelt raised and spent about $11,000 during the recall time period, more than $10,450 went to Creative Geckos of Farmington for advertising. That’s a lot of money she spent on out-of-state companies to keep her job as a county commissioner. Meanwhile, her opponents leading the recall effort haven’t even raised the $5,000 minimum to begin their reporting process. The irony is not lost on us that a major contributing factor to her recall are accusations that Lachelt used the office to further the political gain of the environmentalists who employ her, and that her effort to block the recall is almost wholly funded by environmentalists. « BREAKING! Hancock to Resign as Mayor!